Despite the similar names, 38 Super as a caliber has nothing to do with 38 special. 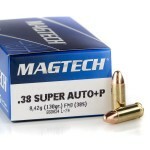 In fact, the super's origins stem from the .38 ACP cartridge. When ammo manufacturers realized that the 1911 style pistols could bear more pressure than other handguns, they powered up the .38 cartridge and starting offering 38 Super for sale. While popularity of the round has hovered up and down throughout its long history, 38 Super is one of the first calibers to rely upon the speed of a bullet for power rather than the weight or sheer size. 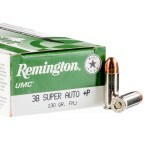 Today, 38 Super is still a relatively popular cartridge. 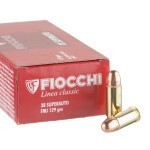 While not one of the big three or four handgun calibers, there is a following that makes the round a common caliber to find for sale in bulk quantities every now and then. With a most common bullet weight of 130 grain, you can get muzzle velocities of 1200-1300 feet per second fairly easily with a +p (increased pressure load). 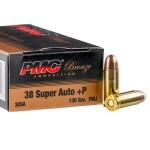 Both full metal jacket projectiles and jacketed hollow point bullets are very common for use in 38 Super. So, you're covered for both range training and self-defense depending upon your specific needs. Most major manufacturers do still produce the cartridge today so you can expect Winchester, PMC, Remington and other household names in your ammo can if you're looking to fill up on the round. 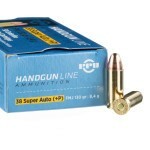 Here is what serious shooters are loading up on!